Krzysztof Piatek has been in fine form for AC Milan since his move from Genoa in the January transfer window, as the Polish international continues to impress fans with his fine performances. The 23-year-old has an astonishing record of 26 goals and one assist in 27 appearances for AC Milan and Genoa this year, a goalscoring record that even players like Cristiano Ronaldo and Lionel Messi would be proud to call their own. Piatek’s fine form for Genoa earlier in the season earned him a move to Italian giants Milan last month, and the pressure of playing for one of the world’s biggest clubs doesn’t seem to have affected the Pole at all. Piatek is so unfazed in fact, that he’s even managed to score in all of his league games for the Rossoneri, a feat that hasn’t been achieved by a Milan player for 21 years. 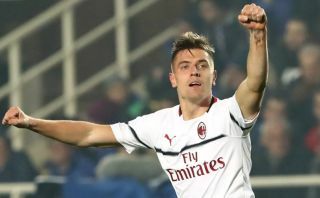 The Polish star scored in his side’s 3-0 win against Empoli on Friday, something that saw him become the first Milan player since Oliver Bierhoff to score in his first four league outings for the club. Piatek is just one goal behind Ronaldo in the Serie A Golden Boot race, however should he manage to keep up the form he’s displayed in his first few games with Milan, we can easily see the Polish international beating Ronaldo to the award come the end of the season. And, should Piatek continue to impress and find the back of the net consistently throughout the next few seasons, we could easily see him securing a move to the likes of Barcelona or Real Madrid in the not-too-distant future.